A Child's Garden | Faddegon's Nursery, Inc.
“What’s best for the environment?” is often asked these days. Well, what’s best for the environment is teaching our children respect and concern for nature. One way to start this training early, and have some fun doing it, is a child’s garden. The immediate and long-term benefits of encouraging a child to plant his or her own garden are enormous. Through school and the media, many youngsters, even preschoolers, are already very aware of nature and ecology. The garden is an excellent place to reinforce what they have heard and learned and a great place to encourage their creativity and self-discipline. They will be exposed to the beauty of Nature, a beauty they will help nurture, and through growing vegetables they may learn a degree of self-sufficiency. A childhood start on understanding and respecting the environment plants the “seeds” for future responsibilities. We all know it needs to be done, so let’s do it with fun. Did you ever “snap” the jaws of a snapdragon, or “see” fantastic faces in pansies, or savor the tangy aroma of fresh mint when you crushed some leaves in your hands when you were a child? Whether you did or you didn’t, there are numerous plants that provide their own extra-special sense of fun and learning. Below are a few suggestions. Maybe you have some childhood memories to add. Some “Fun” Plants to Grow. Torenia – The “wishbone plant.” Inside the bloom is a small ridge shaped just like a wishbone. Cucumbers – Make some pickles later. The garden to table process is super for kids. Any Pumpkins – Imagine a child growing their own pumpkin and then making a jack-o-lantern in October! Sweet Peas – Dwarf or climbing, these lovely flowers have the same name as the character in Popeye cartoons. Maybe you should plant it next to the spinach! A small garden, perhaps no more than 4 feet by 4 feet and planted with a mix of flowers and vegetables, can instill not only an appreciation of Nature, but also provide a place for fun learning activities. Although there is a chance that a child’s garden might not be as neatly tended as a parent’s, give the choicest garden spot you can to the child. Lots of sun and good soil will aid in success. A section of your garden or a separate child’s garden next to yours can make the garden chores a family affair. 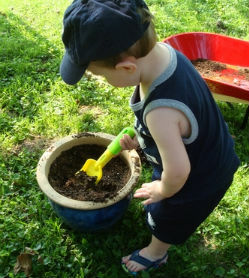 Let your child help prepare the garden soil. Dirt can be turned over with a small shovel or trowel, and clumps broken up by hand or by “stomping” on them. Kids love dirt! Choose easy-to-grow plants and as many different ones as you can get into the small space. Carrots, radishes, lettuces and tomatoes are good vegetable choices. If you have room for the vines, maybe a giant Jack O ‘Lantern or a mini-pumpkin can make the garden experience last a little longer. For flowers, choose at least some that can be used as cut flowers or decorations for the dinner table or for special “gifts.” Zinnias, marigolds, salvia, and snapdragons are a few recommendations. For something spectacular to a child, plant a few sunflowers, which can range form 2 feet to 10 feet tall. The seeds can be toasted and eaten for a healthy snack, or saved to be put out to feed squirrels or other animals. Starting from seed is a good learning experience, and starting early indoors in a sunny spot will provide daily “excitement” as a child watches the growth. Small children will find large seeds such as beans and sunflowers easy to handle and plant. Bedding plants too, are an excellent choice for getting started and are good choices for selections such as geraniums, petunias, begonias and many vegetable plants. Recycling is an important part of our planet’s future, and few activities lend themselves to this as well as gardening does. To grow up to 12 plants you can use a clean egg carton as a seed starter kit. Be sure to punch holes in the bottom of each section for drainage, and use a soilless germinating mix. Outdoors, small plants can be protected from the weather and hungry animals by cutting the bottom or side out of a milk carton and covering tender plants. Grass clippings, shredded leaves and vegetable matter can be put into a composting bin to be recycled into composted soil that is very nutritious for plants. Many communities have active recycling program on a drop-off basis, or as part of their garbage pickup. Instead of just separating recyclable materials for some far-off re-use, using the materials in gardening demonstrates the true meaning of active recycling and may instill the idea of recycling in other ways as well. Less garbage in landfills means more land left for nature. Don’t despair if you don’t have an outdoor garden plot. Vegetables and flowers can be successfully grown in pots and containers. There are books and online sources available on container growing, and many general gardening books cover the topic as well. A container garden on a balcony, patio or deck can produce a lot of flowers and vegetables, and it often makes the task of weeding simpler. Children love something to be their “very own.” Keep your child interested and aware of his or her garden by putting a sign in it that says “Mary’s Garden” (or whatever name is appropriate). For real personalization, make up plant stakes or labels that say “Mary’s beans,” “John’s zinnias,” etc. If more than one child has plants growing in the same garden, this can minimize disputes over whose plants are whose. If you start from seed, you can use the seed packet stapled to a stake with the child’s name written on it. Bedding plants usually come with a plant tag you might use. Colorful pictures help children imagine what will eventually grow. Children love to water – particularly at full force of the hose. You will want to remind them that rain usually falls a little more gently and they should imitate the rain. A personalized sprinkling can is a good idea for younger children. Weeding is another matter. At first, even for adults, it can be difficult to tell small wanted plants from small-unwanted weeds. You may want to let things grow a little before weeding too much. Since children may find weeds as fascinating and as pretty as the chosen plants, a little explanation that the weeds are “little bullies” and want to take too much room and too much food away from the “good” plants may ease the trauma of pulling out some plants. “Patience is a virtue,” goes an old saying, and the wait for flowers and vegetables to mature can begin to teach the rewards of patience. Watching a garden grow may not be easy: children may want to pull up young carrots and radishes to see if they are “done.” Even if they do pull up a few young plants, they may be far enough along to wash off and give a taste of bigger things to come. Children by age eight or nine may want to be more involved in what plants are grown in their gardens. They might enjoy planning a salad garden that can be harvested and shared with the family at dinnertime, or they might enjoy something special like a garden planted to look like the American Flag. You may not have to supervise weeding and watering quite as closely, but a wise parent always keeps one of the eyes in the back of the head open. Gardening activities provide an ideal time to really talk to your child. Of course you will want to talk a little about how plants grow, and talk about the birds, insects and worms (kids love worms!) and all that good gardening stuff. But the privacy and quiet of a garden is also an excellent place to just talk about “things” such as school and friends, hopes and dreams. Ask them if they were a plant, what would they tell the gardener? You’ll be surprised what you can learn in your child’s garden, and your opportunity to hear your child’s thoughts will help you guide their personal growth as well as their gardening growth. Whether you are in a city, suburb or rural area, the future of the environment is a concern to all. Instilling love, respect and understanding of how nature works and how it affects us all is especially important for the future of our children and the world at large. And it can all begin in a child’s garden.